Megan Offner and co-founder Dave Washburn started New York Heartwoods (NYH) in 2010 with the intention of harvesting of dying and diseased trees in the forests around their mill with low-impact methods, allowing the best trees to grow and propagate—known in the business as “selective harvesting”-- while providing them with enough wood to support their decidedly sustainable business model. NYH caters to the educated consumer and contractor who cares about the methods of how and where their wood was procured, and in doing so questions standard, ecologically detrimental commercial forestry practices like clear-cutting. In 2012, Offner mentioned in an outreach email that “the abundance of dying and downed trees within two miles of our mill is more than NY Heartwoods could currently process in the next ten years,” proving to skeptics that clear-cutting large swaths of forestland is not the only ticket to profitability. Offner has steadily grown her business, and today the NYH facilities include two wood drying kilns (one solar, one an energy-efficient dehumidification kiln), wood drying racks and covers, a sawmill, dried wood storage, and a small woodshop where custom products are fabricated for designers and retailers. She is currently expanding her inventory by brokering reclaimed barn wood, as well as lumber and slabs milled by other local sawyers who share NYH’s ethos. While still a small business, NYH is not afraid of thinking big. In addition to coordinating daily operations, which are the very embodiment of resourcefulness and efficiency, Offner is actively affecting forest policy in New York State. NYH is in ongoing dialog with experts at the New York State Department of Environmental Conservation, the Environmental Protection Agency, the Economic Development Agency, the Mid-Hudson Regional Economic Development Council and Cornell University Cooperative Extension. Offner took some time from diverting thousands of feet of board lumber away from landfills to graciously answer questions from sub_teXXt about her past, present and future as part of a sustainable construction supply-chain. Shea Gilligan: Let’s start with a little bit about your background. Do you think that growing up in Montana influenced your current profession? Did you spend a lot of time outside, playing in forests growing up? Are there woodworkers in your family? Megan Offner: Growing up in Montana definitely instilled a deep respect and reverence for the natural world. Clear-cutting forests was common when I was young, a sight that always disturbed me. I did spend a lot of time outside, camping, hiking and skiing with my family, catching salamanders with my brother, swimming in rivers with my friends. My grandfather and uncles work with wood, and my mother is very crafty. She took a woodworking course to build me my first dollhouse for my first real (leap year) birthday - my preference for handmade things versus store-bought was definitely formed by her. SG: I know that you had some training in sustainable design/building, what long-lasting lessons did you take away from those courses? How does design influence the way that you work with lumber now? MO : I am inspired by the concept of closed-loop, or waste-less, systems. For example, I aim to dry our wood by generating heat, and possibly power, from our "waste" (sawdust, shavings, scrap wood). As our resources become increasingly depleted and denuded, I believe it is necessary to design regeneratively, not just sustainably. In our case, that will entail replanting and stewarding forests in addition to our upcycling of fallen and dying trees. I am excited to keep growing NYH to have the resources to implement these practices. My previous design-based occupations-- working with architectural salvage, project managing for an architect, and designing sets for fashion/advertising photo shoots-- taught me to be very resourceful. Working with downed/dying trees is similar in that we have to be creative with what's available to us. What I love about wood is that it needs very little designing - nature has already done all the real work. SG: Tell us about your passive solar kiln -- we LOVE it -- how was it built? What materials are you using? How efficient is it? How large is the space that you have and how much wood can you cure/dry in it? MO: A variety of solar kiln plans are available online. The one we built is based on a plan from Virginia Tech. We used a lot of recycled plywood and rigid foam insulation, donated plexiglass, etc. It's a great little kiln (700 board feet), however we outgrew it quickly and built a super-efficient dehumidification kiln that can dry over six-times the amount of wood (4500 BF) in 1/4 of the time of our solar kiln (2-6 weeks vs 2-4 months). We milled all of the framing lumber for this new kiln from Hurricane Sandy-downed black locust and spruce trees. Again, we used a lot of recycled materials where possible. The new kiln also allows us to monitor the temperature, so that we can be sure to be in compliance with certain regulations. Due to the Emerald Ash Borer infestation, for example, we must comply to certain temperature cycles when drying our ash lumber. SG: Fundraising – How did you raise money for this? Tell us about your decision to not use a crowdfunding platform... and how you made raising $25,000 seem so easy. MO: This money was raised in 2010 for infrastructure investments including a large, salvaged insulated shipping container that we will retrofit into part-dried-wood storage and part-dehumidification kiln for drying more lumber year-round, a double-ended chainsaw and an Alaskan sawmill to process logs too big for our sawmill (over 32"), a used resaw to process logs that are too small, a metal detector to help us more safely process the urban trees that we are upcycling (they often grow around nails, wire fencing and clothes lines). 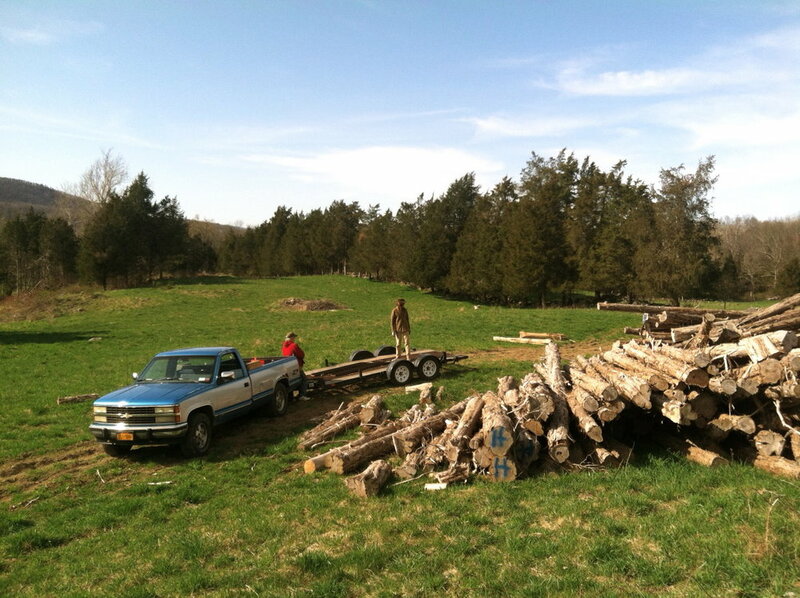 We needed an affordable, reliable 4-wheel drive pickup truck for towing our log trailer and for delivering our wood, additional air-drying racks. We renovated our woodshop to facilitate production, and moved truckloads of gravel to improve our paths, easing the movement of lumber from the mill to air-drying racks, into the kiln and in and out of storage. Kickstarter turned us down because we were were raising money for infrastructure, not a specific project. I investigated other crowd-funding platforms and wasn't taken by any of them. I decided to manage my own fundraiser though my personal email list and NYH's website, believing in the power of my relationships and the value of my vision. I spent a lot of my life investing in the creativity and passions of others. This was the first time I really asked for community support for something of my own, and was overjoyed at the response. SG: You’ve helped change policy! Damn, that's impressive, what motivated you to get involved with legislation? How does it directly impact what you do at NY Heartwoods? MO: My motivation started when I was encouraged to speak, as a small business owner, at the last meeting for public comment for the Mid-Hudson Regional Sustainability Plan in November 2012. The plan addressed land use, livable communities, transportation, energy, materials management, agriculture and open space, water, climate change mitigation, climate change adaptation, environmental justice, economic development, and governance. I shared my opinion that when we deal with the issue of our dying trees and their potential value, we can create positive solutions for each and every one of these topics. The writers of the plan spoke at length about our watershed and our foodshed, but they neglected to address our wood shed. The meeting was just several weeks after Hurricane Sandy, and there was no denying the impact of trees on every citizen. By making this point, NYH was mentioned in the final Plan as an "innovative business" with "great potential, given the tremendous demand locally as well as in New York City. They also benefit from the Region’s forest resources in a way that sustains forest cover and biodiversity." I realized that speaking my truth can truly make a difference, and it inspires me to continue to do so. I have a vision of what is possible with the management and conscientious utilization our trees and forests, but the vision is greater than me and NYH alone. It takes a village, a county, a region. With changes in policy, the impact can grow beyond my grass-roots business into whole systems that benefit both a green economy and the conservation our natural resources. SG: Game of Logging has caught on across the country as a way of teaching tree-felling techniques through competition. Tell us more about that and your decision to get involved in it. MO: I learned about Game of Logging (GOL) when training with a forest manager in 2010. When I started my business we intended to do forest management and cull dying and diseased trees for our mill, so I put myself and two of my colleagues through the first two levels, and our main chainsaw guy through the third (of four). Bill Lindloff, our instructor, is a brilliant teacher and one of the best chainsaw operators in the country. The GOL Training was developed in the '60s by a Swedish Logger, Soren Eriksson. His methods have improved the efficiency and safety of the thousands that have taken this course. Reportedly, tree workers who have graduated from the program are 85% less-likely to get injured, so taking the training can cut insurance premiums in half. We now host a couple of these courses each year in Warwick. Downed and distressed trees are expensive to have removed, so we do our part to empower and educate landowners to do as much as they can themselves. We also offer to remove any sawlogs suitable for our mill - a win-win arrangement. This is the third winter that we have partnered with the New York Center for Agricultural Medicine and Health to offer grant-funded (free!) classes to farmers. We have Level 1 and Level 2 courses available. Anyone interested in more information should contact megan@newyorkheartwoods.com.